For some reason the CAN decoder statistics starts decoding at 524 kbaud while initial setup tells 500 kbaud. It seems this only happens when using streaming mode. When checked with the rulers the bits are exactly 2 us and not 1.9 as 424 kboud would be. 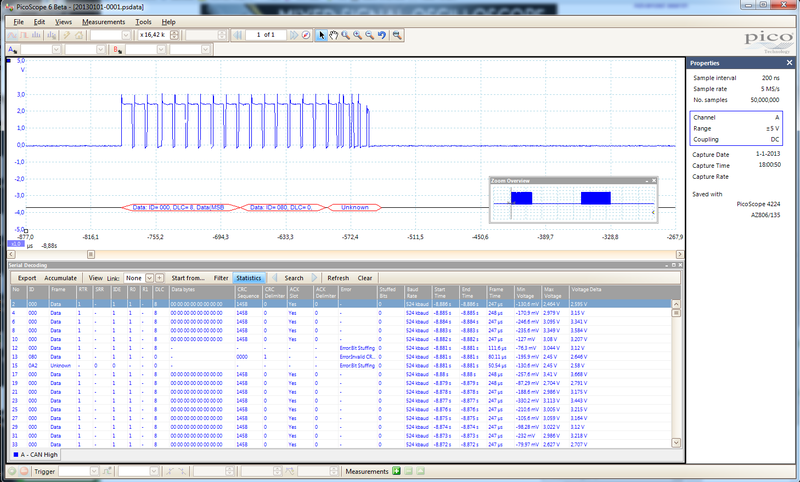 Because of this the analyser thinks there are errors while there are no errors. Both types of error can be seen in above image. I have opened up your data file and do not see the data you have posted in the image. Can you repost an image with the complete Picoscope screen, not just the serial decoding table, and including the vertical rulers showing the 2us as well. Rechecked and it was working with the 6.7.10 Beta I had installed, but does fail as described with 6.7.11, so I have flagged this for investigation. If you change the decode threshold to 1.2V it works. The developers are working on this section of code and have mentioned that this is a Beta so is not bug free. I know this is a beta version, i am trying to help the developers. And using the Picoscope primarily for CAN bus problem solving. I don’t know if the 524 kbaud is the result of the data decoding of the source for the decoding. If it is the source then the errors will disappear when the baud rate is calculated correctly.